Sweeping views of the Pacific Ocean and surrounding countryside welcome in beautiful golden sunrises over this one-bedroom, one bathroom private cottage. Newly built, among 6 acres with a cool spring-fed stream, you will find over 400 fruit and palm trees, including avocado, lemon, lime, bananas, grapefruit, oranges, lychee, and other rare tropicals. 425 square foot cottage includes a kitchen, living and dining areas, TV with satellite channels, and WiFi internet. Outside, relax on attached private 200 sq ft lanai (patio) with a bbq grill. Our property is 10 miles north of old Hilo town, 12 miles from the Hilo Airport, 40 minutes from the Kilauea Volcano National Park, 40 minutes to get to Mauna Kea with observatories, 6 miles from a beautiful beach. It is a quiet and peaceful place situated about a third of a mile from the ocean on a bluff. Because we are a working orchard with a stream, we are reserved for adults only, with room for 2 guests. Orchard and suite are owner operated, alongside their strictly outside, friendly border-collie, Lily. We, proprietors Bob & Fa Jung (Kady), live in a separate home on the property as well as host the private cottage. Retired, we spend our days on our property doing what we love, being in the beautiful outdoors and farming. We have a cat, Skunky, and our border collie, Lily, who is strictly an outside dog. As a third generation Southern Californian, I knew there was only one place I could move. My wife, Kady, originally from Taiwan by way of New York and California, was of the same mindset. So we searched the islands as retirement beckoned. We settled on the windward side of the Big Island because of its climate, country setting, and people. We never dreamed we'd find such a wonderful place as what we call the Sun & Moon Orchard. So much so we want to share it with those who come to the Island looking for something not found among ordinary Hawaii travel plans. Large granite countertop allows plenty of room for toiletries and grooming/make-up. Custom tiled shower with sea glass accents is big enough for two and features a shower head that can detach to be hand-held. We absolutely loved this little cottage - it was perfect! The only regret we had was that we couldn't stay longer. Bob & Kady were so helpful and friendly. There visitor binder was so well laid out with lots of great info on the area, good restaurants of which we tried 2 and were very happy - Don's Grill & Jackie Rey's (fine dining). This cozy little cottage is beautifully decorated and so clean, and a comfortable bed too. We stayed at 4 different locations on the island and this sweet spot was top notch! 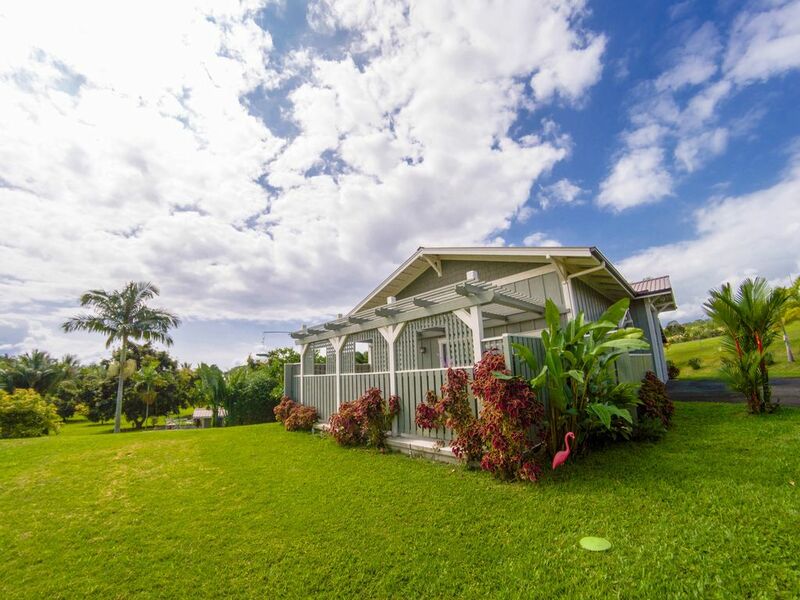 Great location - only 10 minutes from Hilo. Be sure to take the 4 mile "scenic drive", ask Bob about it - it was very beautiful. We absolutely loved our stay. Bob and Kady were excellent hots. Our only regret was that we didn't stay here our entire trip. Would definitely stay again. My wife and I on a recent trip to the Big Island spent three days outside of Hilo in a small cottage and our experience could not have been better. Lovely cottage, beautiful location and our host and hostess, (Bob & Cady), delightful and accommodating. Also, included at no charge is entertainment and love from their border collie. On our return to Hawaii this location will be on our list. The cottage is located on a 5 acre orchard, very clean and comfortable for a couple. Kitchen basic, but has everything that is needed and is more than sufficient to fix all meals. Bob and Cady live on the premises, friendly and available but not at all intrusive. The cottage is about 8 miles from Hilo, traffic no issue, and a great escape from the touristy crowded Kona district. It is a great location for a day visit to Volcano National Park, Also numerous waterfalls are in close proximity. If on the Big Island and looking for a tranquil setting, and beautiful clean cottage stay here. We thoroughly enjoyed our stay at this lovely private cottage nestled on a beautiful 6 acre orchard. The cottage was well appointed and very clean. The owners were very gracious. This is a perfect place to stay if you want to explore the Hilo area of the Island yet have a peaceful, relaxing get away. Lily the border collie was an added bonus - she was lovely. Will return again as it was a beautiful Island experience. Incredibly beautiful location. Hosts were wonderfully pleasant and helpful in every way. House was immaculately clean. We loved the fresh fruit and eggs. And there was a great dog! Two botanical gardens, the best surfing (body, boogie & board) beach on this side of the island and two zip lines within 10 miles. Smoothies and lunch counters on scenic drive nearby. Cleaning charge of $65 per booking. Daily maid service is available at a rate of $25 per day.